Bitcoin's $20,000 bubble mania peak of Mid December that valued the crypto currency at $320 billion has long since been left in the dust as Bitcoin has crashed well below $10,000, wiping out $170 billion of the value of participants holdings. All whilst the crypto coin gamblers obsessed by all things block chain have largely remained in a state of denial, focused on bitcoin soaring to over $50,000 despite its real inverse trend trajectory as tends to happen at the end of market manias. 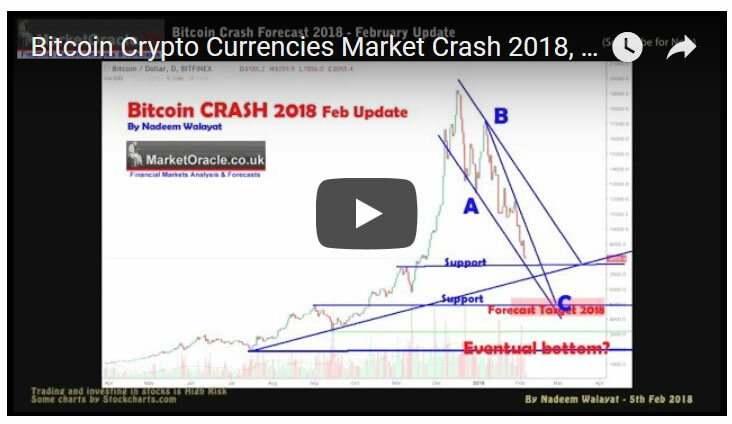 And so it has been the case since I published my opening Bitcoin forecast of the year over a month ago when the crypto was trading at USD 14,000, warning that the Bitcoin price was likely to continue crashing towards $5,000, a forecast that was met with denial from many in the bitcoin community. So find out in my latest video what the prospects for Bitcoin are now that it has plunged below $10k. The gold price had a good start for 2018, rising from 1310 at the start of January to a high of $1367 with the most recent trading price of $1351. Which is set against my forecast for 2018 for the gold price to first target resistance $1375, an eventual break of which would propel the Gold price towards a 2018 target of $1500, and then further for the Gold price to ultimately target a trend towards $1800. 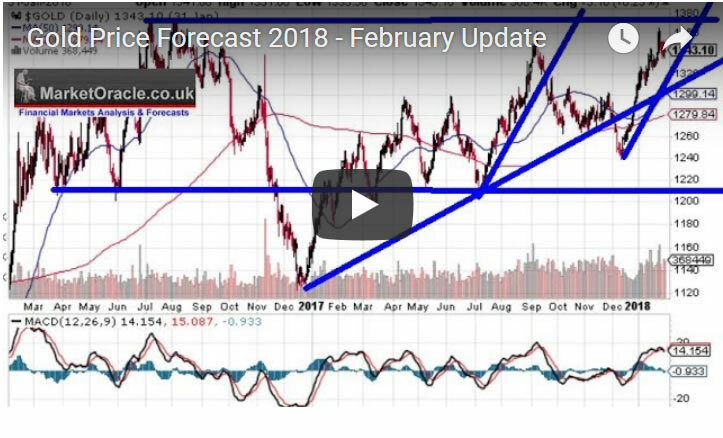 So found out in my recent video the prospects for the Gold price during February. Stock Market Still Heading for a 1929 Moment? The stock market has FINALLY topped and started its significant correction, if you have been following my analysis then you will know its been a LOOONG time coming as my year start stocks forecast illustrated my bearish expectations for an near imminent significant correction down towards a target of 23,000 as being healthy for the stocks bull market. A quick look at the Dow chart shows that despite being overbought, the Dow is not showing signs for an imminent demise to this stocks bull market. 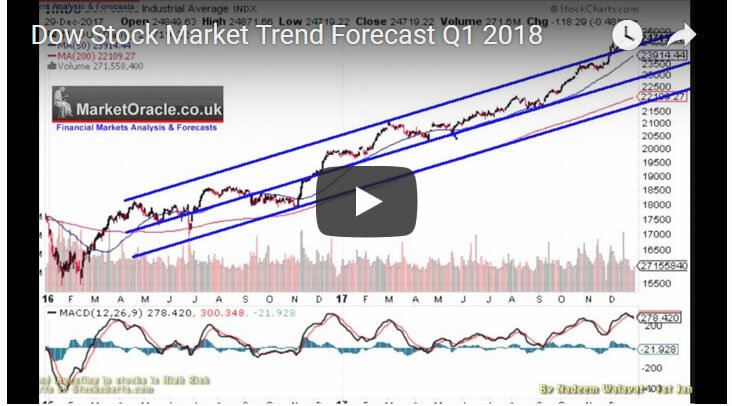 Whilst the most probable trend likely to materialise over the first few months of 2018 is for the Dow to revert back down towards hugging the central trendline that currently stands at very distant 23,000. So ahead of my in-depth analysis I would not be one for expecting the Dow's December surge to continue during January, instead expect the Dow to unwind its overbought state. And as the market failed to correct I have increasingly became alarmed for the bull markets future prospects, even warning of a possible 1929 moment, where the stock market not only crashes, but CRASHES and BURNS in a BEAR MARKET that could result in a 90% wipeout, so the higher the stock market rose the greater the probability for a 1929 moment has become. Clearly given the ongoing rally the market is continuing to deviate from my expectations. For me this is a RED DANGER WARNING FLAG! That I need to do in-depth analysis of to try and get a grip with, and even then I may not be able to wrap my head around the markets current behaviour. However, the thought that is increasingly coming to mind is 1929. You know what happened in and after 1929, the stock market did not just crash, it crashed and burned for three long years from a peak of around 390 to a low 40! Yes, I am a stocks bull, and despite being bullish on sectors such as Artificial Intelligence, I am seriously considering liquidating most of my remaining stock holdings which despite the rally are at about 50% of peak exposure i.e. I sold 50% of my holdings a year ago, and sold some more during the remainder of 2017. But seriously this is not healthy, yes, I am prepared for a temporary 20% to 30% loss on what's left when the market turns, not 'IF' but when it turns! BUT a 90% LOSS over 3 years! That would be PAINFUL! So with the stock market finally having started to correct towards my original target of 23,000, is putting my mind at ease that the 1929 crash and burn scenario has diminished in probability. However, given the deviation to date against my forecast expectations at the start of the year, then I really do need to undertake an in-depth analysis to determine the most probable trend going forward which will be the focus of my NEXT major analysis, so do ensure you are subscribed to my always free newsletter and youtube channel for my forthcoming in-depth analysis and detailed stock market trend forecast. And lastly a Special 5-day event (free) from Elliott Wave International : "Best Commodity Opportunities to See Now"
Volatility is picking up steam -- and it's more than just Bitcoin and U.S. stocks that deserve your attention. "...the best backdrop to own commodities since at least 2004... History says commodities will outperform stocks [in 2018]"
"Best Commodity Opportunities You Need to See Right Now"
You'll get free, subscriber-level forecasts from at 22-year commodity market veteran and one of Elliott Wave International's best and brightest, Jeffrey Kennedy. He'll walk you through new commodity opportunities on his radar: grains, ags, softs, meats, maybe even crude and more -- each day for 5 days. This is a one-time only, free event for active traders. Sign up free, with no commitment or obligation. Join the free 5-day event now: "Best Commodity Opportunities You Need to See Right Now." P.S. On February 5-9, our friends at Elliott Wave International (elliottwave.com) are hosting a special, free 5-day event for commodity traders, "Best Commodity Opportunities You Need to See Right Now." Learn more and join in, free.